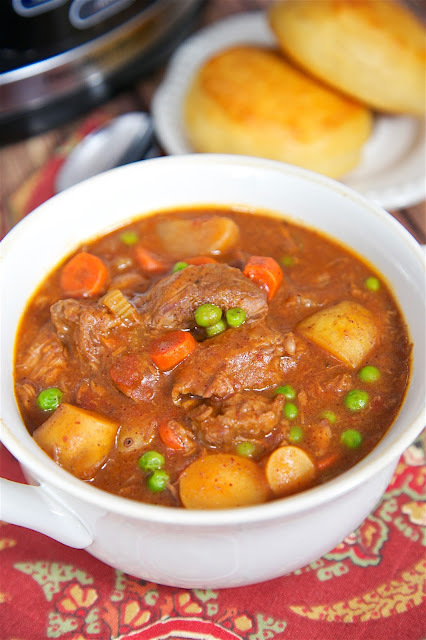 Slow Cooker Beef Stew - beef, potatoes, carrots, green peas, tomatoes, celery, chili powder, brown gravy mix, beef broth. Comfort food at its best! So easy and SO good. Everyone gobbled this up - even the kids!! Serve with some biscuits or cornbread for a complete meal! 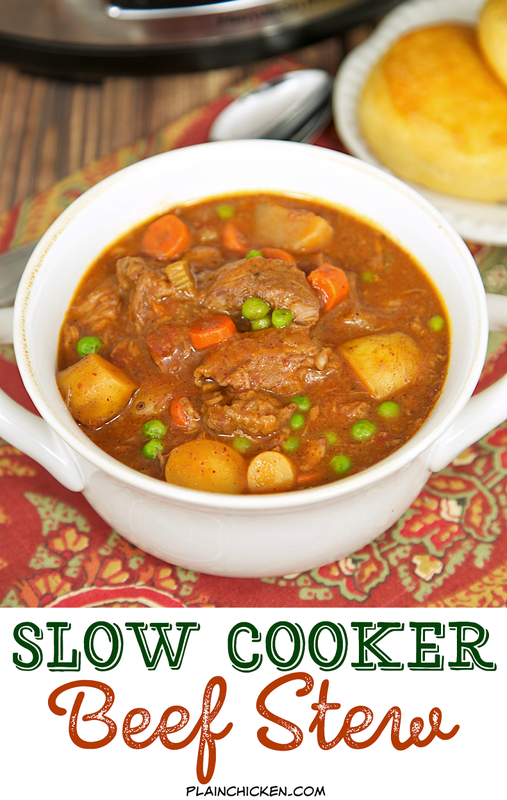 Beef Stew is one of my favorite slow cooker meals. It is comfort food at its best. Beef, potatoes, carrots, tomatoes and green peas. It is our favorite way to eat veggies! They taste SO good slow cooked all day in yummy beef flavors. Complete the meal with some biscuits or cornbread. 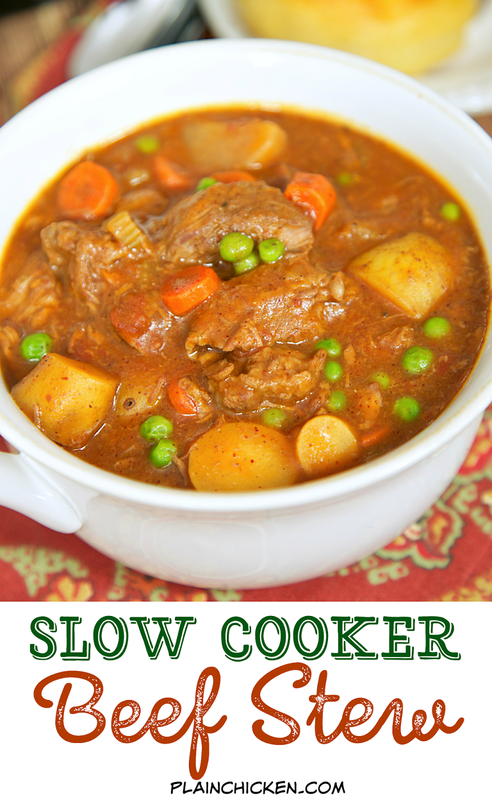 This recipe calls for the stew meat to be browned before adding to the slow cooker. You can do this the night before or skip it all together. I think it adds more flavor and a nice color to the meat, but it isn't going to ruin the stew if you skip browning the meat. This stew was a little thin after it was finished cooking. We prefer a thicker stew, so I added a little cornstarch and water to thicken it up. 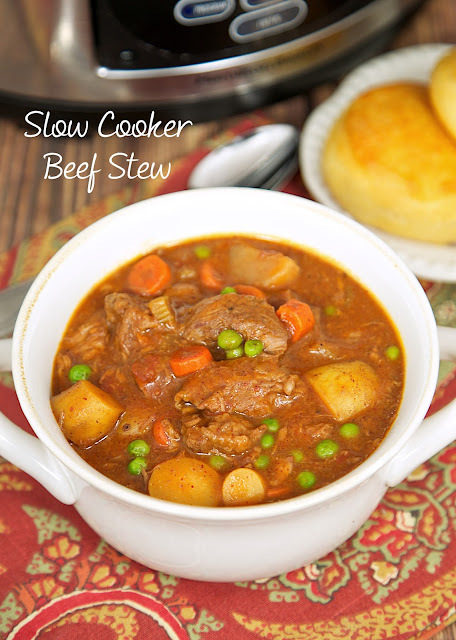 If you like a thinner beef stew, you can skip that step. Either way, the flavors are great! We ate this for dinner and lunch the next day. SO good!! Coat the stew meat in the flour and sugar. Brown in canola oil in large skillet. Transfer meat to crock-pot. Add tomatoes, celery, potatoes, carrots, tomato paste, chili powder, thyme, garlic powder, pepper, brown gravy mix and beef broth. Cover and cook on LOW for 8 to 10 hours. Add frozen green peas to slow cooker. Whisk together corn starch and water. Pour in the stew and stir. Cook on LOW for an additional 15 minutes, or until thickened. It's just the way my Mom does it with her standard recipe. Looks very good Steph and I'm with you on the slow cooker. I never thought of adding chili powder. Pinned and stumbled, this is perfect to come home to after a long day out in the nasty weather we have been having. you can also thicken the stew with a little instant potatoes. Add a little at a time and stir well.